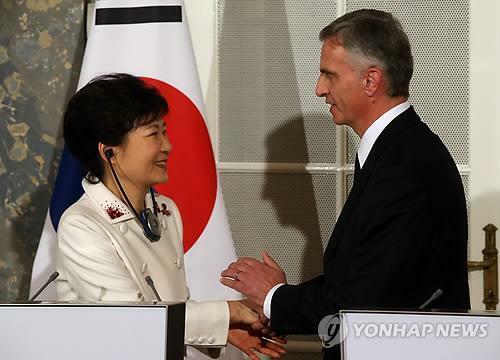 South Korea said Tuesday it will hold talks with Switzerland in Seoul this week on promoting bilateral cooperation in three main fields - basic science, industrial technology and life science. The fourth meeting of a related joint committee, slated for Wednesday, coincides with a Seoul trip by Swiss President Johann Schneider-Ammann for a summit with President Park Geun-hye. The two nations signed an accord on science and technology partnerships in 2008 and launched the committee a year later. During Park's trip to Switzerland in January 2014, the two sides agreed to strengthen cooperation in the science and technology sector. In this week's session, they plan to review progress in joint research and development projects and have in-depth discussions on the direction of future partnerships, said the Ministry of Science, ICT and Future Planning. Its counterpart at the meeting is State Secretariat for Education, Research and Innovation. The ministry said it is scheduled to ink a deal with SERI to initiate a new cooperation program to support the exchange of Ph.D. students starting late this year.